Elizabeth Yarrow’s death spans two years. Her age at death spans 8 years. Two churches registers, and a gravestone all give conflicting and some corresponding information. What’s the real answer? I have a mystery to solve and hopefully the death certificate of an Elizabeth Yarrow, whose death is recorded in the June quarter of 1838 in St Pancras, will unravel it. This gravestone stands in Stretham churchyard, Cambridgeshire, amongst many other Yarrow gravestones. There is something engraved near the foot of the stone but I can’t make it out now, and perhaps didn’t spot it at the time. However, this stone appears to have some errors. 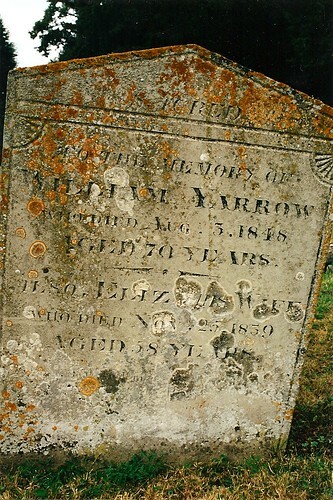 The Stretham burials transcript gives William Yarrow as being 71, and Elizabeth Yarrow (née Wright) as having been buried in 1837. The Little Thetford burials transcript (Little Thetford being a hamlet of Stretham and it’s common for inhabitants to be buried at Stretham), gives a different story: “YARROW Elizabeth otp 50 wife of William farmer, died in London was carried home and buried at Stretham” (Nov 23 1837). This gives two positive mentions of 1837, rather than the stone’s 1839. The Stretham transcript gives the right age for her, but not for him. There’s no mention of William in the Little Thetford transcript. Looking at FreeBMD, there’s only an Elizabeth Yarrow death (so far) available, and that’s the one registered in the June Quarter of 1838 at St. Pancras! The GRO certificate is ordered… so lets see what it uncovers. Maybe the stone was erected many years after William and Elizabeth deaths, and so family couldn’t quite remember? Elizabeth’s death was registered in the June 1838, because certification was new in late 1837 – perhaps they were resisting it (like some), or simply didn’t know that certificates had to be issued or how to go about it? The 1838 death turned out to be the death of an 11 month old child. No further along with solving this one. I’ve got the appetite to revisit this case now, and now that the General Register Office offers a searchable index, I’ve spotted an ‘Elizabeth Yerroll’ who dies in The City of London Union, in the December quarter of 1837, aged 58. That’s a tick for age, quarter, year, and location. If she was visiting London at the time and died, or was taken ill, would those with her have been able to convey a correct spelling of her surname in 1837, and would those writing it down have known any different or understood a fenland accent of the informant enough to realise it wasn’t ‘Yerroll’ but ‘Yarrow’? It’s another £9.25, but I’m going to gamble and order this certificate. Fingers crossed! Next Next post: POLL: At what age were you when you started your family tree/genealogy research?